Coco Bonbons first collection came out in the Fall of 2006 and it was an instant success. Their clothes are made from bright colours and quality fabrics and the unique design features make this company a hit with parents. I love the wide selection and uniqueness of their clothing. I can picture Bridget wearing all these cute clothes. Coco Bonbons carries both girl’s and boy’s outfits in size 3 months to size 8. I received both a girl’s and boy’s outfit for my review. 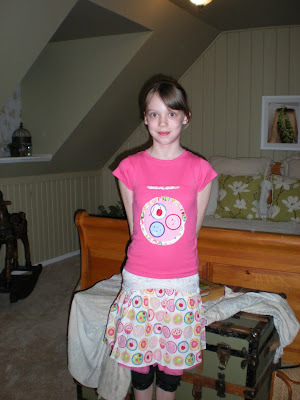 For the girl’s outfit, I received Josie (Cupcake) Knit T-Shirt w/Applique and Josie (Cupcake) Print Skirt in size 6X. This outfit is so sweet and first thing I noticed was the attention to detail. The shirt has cupcake appliques on both the front and the back which make it stand out among the other clothes in my little girl’s closet. The skirt has a cupcake print and three layers of tulle which makes it truly special. 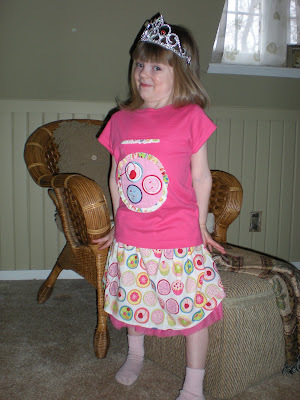 My little girl loved the skirt and had such fun twirling in circles make the skirt puff out. I originally thought that this outfit would be for my youngest daughter, Bridget. She’s 4 years old and normally wears a 6 or 6X. However, it also fit my oldest daughter, Olivia, who is 10 years old. Olivia is pretty slim so it was a bonus that it fit both girls. I think this outfit is reasonably priced at $38.00 for the skirt and $34.00 for the shirt. I would definitely shop here again. For the boy’s outfit, I received the Charlie (Suits) Striped Sport Coat and Charlie (Suits) Striped Tailored Pant. I have to say that I was really impressed by this outfit. It looked absolutely adorable on my cousin Allison’s son, Connor. 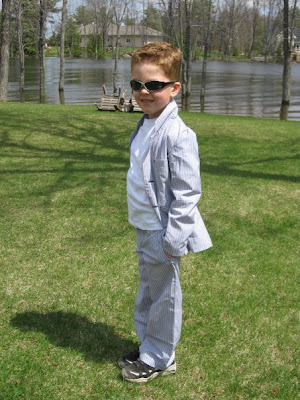 We got him a size 7 and it fit him to a T. He wore it out to his brother’s First Communion and received numerous comments on how spiffy he looked! It was comfortable for Connor and will be something he can wear again for the next special occasion. This particular outfit cost $59.50 for the coat and $38.00 for the pants. I think it’s well worth the price! To make a purchase at Coco Bonbons, please visit their website or find a store near you.